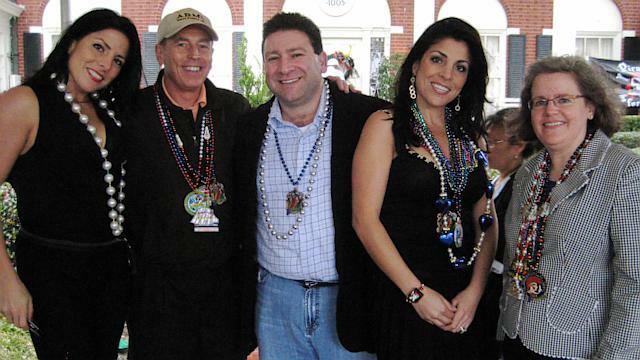 Petraeus Affair: Who Is Jill Kelley? WATCH David Petraeus Scandal: Who Is Jill Kelley? This summer when Kelley received anonymous e-mails accusing her of flaunting a friendly relationship with military brass in Tampa, she called the FBI, which traced those e-mails back to the computer of Paula Broadwell, co-author of the Petraeus biography "All In." Investigators are said to have found emails in Broadwell's inbox that pointed to an intimate affair with Petraeus. Petraeus announced his resignation as CIA director on Friday. Kelley and her husband Scott have also had to grapple with financial problems. They have been sued at least nine times. The couple faces foreclosure on their waterfront mansion and on an office building they own. Court records indicate that the Kelleys owe more than $2 million on the office building. The Kelley home also served as the office for a charity she and her husband set up for cancer victims that spent tens of thousands of dollars on travel, meals and entertainment. The FBI has now uncovered "potentially inappropriate" emails between Gen. Allen and Kelley, according to a senior U.S. defense official who is traveling with Defense Secretary Leon Panetta. The department is reviewing between 20,000 and 30,000 documents connected to this matter, the official said. The email exchanges between Kelley and Allen took place from 2010 to 2012. But Kelley and her sister had apparently grown so close to the high-level military officials that both Petraeus and Allen wrote letters on Khawam's behalf in September as she battled her ex-husband Grayson Wolfe for custody of her son, even as the judge in the custody dispute wrote that Khawam had "severe psychological deficits."